Frida Kahlo's personal style was as distinctive as the art she created. And while we've been able to view her works in museums, her wardrobe has been off-limits--until now. In November her clothes--in storage for 50 years--went on display at the Frida Kahlo Museum in Mexico City, in an exhibit sponsored by Vogue Mexico. In this fascinating piece on Kahlo's wardrobe by NBC Latino, we get a brief sneak peek at the collection. The too-short slideshow includes shots of painfully beautiful pieces that were inspired by Kahlo's own physical pain: a prosthetic leg, and leather corsets that bring Helmut Newton photographs to mind. In addition to a childhood bout of polio, Kahlo was severely injured in a bus accident as a young woman; her right leg was amputated shortly before her death. The contrast in her wardrobe between these stark, therapeutic, structural pieces and the flowing skirts and peasant blouses that covered them is rather breathtaking. If you are visiting Mexico City over the next ten months, this exhibit is a must-see. Naturally this prompted the question: "What other artists' closets would we like access to?" Our list of dream closets in which to play dress-up, next. 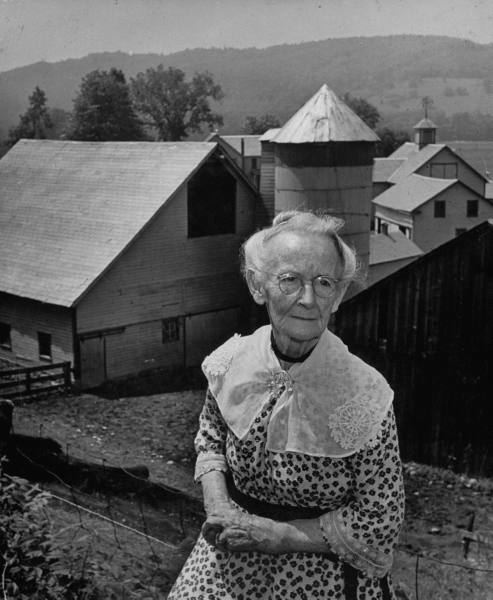 You may be thinking, "Grandma Moses?!" but yes, we'd love to get a peek at that wardrobe of hers. GM started out with embroidery, and moved on later to painting canvasses, so it stands to reason her drawers were probably stuffed full of little treasures--hand-sewn hankies, perhaps, or even days-of-the-week underwear. We cherish the idea of all the beautiful aprons--vintage-style country aprons that hipsters pay $60 a pop for today--we imagine Grandma Moses wore, bustling about her daily life. Photographs show her in all manner of charming pieces: ladylike hats, lacy blouses, and oversized lace collars secured with a brooch. Old photos of Georgia O'Keefe hint at a Coco Chanel quality: plenty of black, lots of clean lines, and menswear-like tailoring. Most of the photos of her online show O'Keeffe unadorned by jewelry, while the website for the O'Keeffe museum describes her manner of dress as reflective of her art: "reductive, simple, elegant." But rather than indicating a lack of caring, her minimalist aesthetic would likely reveal itself through her wardrobe in simple but special pieces. With a personal style so intimately linked with his pop-culture art, Warhol's wardrobe would be a tangible tour through topics that still resonate with us today: sexuality, celebrity, faith and religion, and commercialism. He was "on the scene" with many of the most stylish icons of his day (Liza Minnelli, Mick Jagger, Elizabeth Taylor) and he remains one of the most recognizable figures in pop culture, some 26 years after his death. Warhol loved and lived fashion via the blonde bob/Dutch Boy, the oversized eyeglasses, and--of course--Edie Sedgwick. Photos show him in suits, paint-splattered turtlenecks, knits in funky prints, and the occasional jaunty, wide-brimmed hat, leading us to believe his style was as of-the-moment as his art.